Charity is one of Sevan’s five core values. Sevan’s commitment to charity is backed by an offering in the company’s benefits package—all full-time employees are offered eight hours of paid time-off to engage in volunteer activities of their choice. Sevan’s charity goal is “to help people help themselves and value community involvement.” To demonstrate the corporate commitment to charity, Sevan made donations totaling $76,000 to three charities at the 2018 holiday party in December, including Fisher House Foundation, the Leukemia & Lymphoma Society and the Ronald McDonald Charities of Chicagoland & Northwest Indiana. Sevan Senior Project Manager Kurt Norrell mentored a middle school team in an annual competition held at Boise State University. His 2018 team of five students produced a scaled model of a hypothetical city in Iceland that was primarily powered by geothermal resources and supplemented by wind power. Norrell offered tips, tricks, best practices and math guidance. Twenty-seven teams participated in last year’s event, for which Sevan was a banner sponsor. Norrell’s team learned science, technology, engineering, math and most importantly, leadership and teamwork throughout the competition. Boise-based Intern Kelli Chiles also participated in the judging of a special award for Best Future City Project Management. 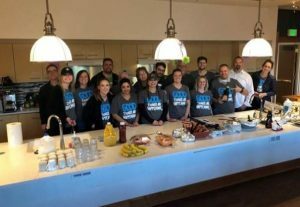 Randy Barnhill, Sevan Project Executive, volunteered with a team that served a hot breakfast for more than 100 guests on December 11. His team coordinated the effort with Starbucks’ Western Mountain Division, which pitched in with volunteers, supplies and coffee. Project Manager Fidencio Pena and Assistant Project Manager Kayla Bruegger were also involved in the provisioning, cooking and clean up. There are currently more than 350 Ronald McDonald Houses around the U.S. and in more than 40 countries around the globe. They offer a place to stay for families with hospitalized children under 21 years of age. Hope starts with food. That’s why Madeline “Maddy” Menna and her two teenage children have been preparing food packets for hungry children and families around the world for more than 10 years. Menna, a Senior Project Manager, started pitching in with Feed My Starving Children to help her kids fulfill a school requirement to log service hours by filling international food packets. Packing groups log into the organization’s website to find an upcoming time and location. Then they compete with other groups to fill the greatest number of “ManaPacks” and boxes of nutritious foods and vitamins to distribute around the world. Bradd Weddell, Operations Director for Sevan, has also been involved with this charity in a different location. His teams of up to 35 volunteers have packed tens of thousands of meals. Weddell has committed to volunteering quarterly for stints ranging from 90 minutes up to three or four hours. Ashley Brown is a weekly volunteer with Holistic Riding Equestrian Therapy, a non-profit group that utilizes equine therapy to improve the physical, emotional, cognitive, and social aspects of the lives of children and adults with special needs. By day, Ashley is a Procurement Specialist helping Sevan’s clients source materials for their construction projects. But every Thursday at 5:30 p.m., she’s helping riders learn grooming, tacking and riding skills. And the horses seem to have the same calming effect on the riders. Ashley has a horse of her own named Skyy, a palomino quarter horse. As a child in upstate New York, Ashley showed Arabian horses, competed in dressage and rode trails. Holistic Riding Equestrian Therapy has added a program track for veterans in the Chicagoland area that will be launching in early Spring of 2019. The program is being held at their satellite location in Lockport, IL, where veterans will learn groundwork, riding, and bonding with the therapy horses. To learn more about the Sevan Charitable Foundation and the importance the company places on helping the community, visit the Charity page.